"There is not a community solar market yet, but we're about to experiment with it in a real way." The California Public Utilities Commission has approved two sweeping programs in recent years to spur community solar construction in the state, but the market has yet to gain real traction. Solar developers are now scrambling to organize projects as these programs advance and new opportunities crop up. “There is not a community solar market yet, but we're about to experiment with it in a real way,” said CPUC Commissioner Martha Guzman Aceves, in an interview with GTM. California is a leader in U.S. solar development, but the state has deployed few community solar projects so far, with a little more than 100 megawatts of mostly one-off projects built to date. Community solar has not found fast footing in the state. Today, there are still virtually no up-and-running community solar projects within California’s investor-owned utility territories, which make up the majority of the state. That’s a problem, as millions of people across California rent their homes or are otherwise unable to install rooftop solar. Community solar provides an access point for these people. The first program, adopted by the CPUC in January of 2015, is dubbed the Enhanced Community Renewables program. Under that policy, which was created by Senate Bill 43, developers market community solar directly to customers as an electricity product. Customers can buy a share of a local solar project directly from the developer and then receive credit for avoided generation costs from the utility. The program is one slice of the state’s 600-megawatt Green Tariff Shared Renewables portfolio, but there is no specific carve-out for community solar. 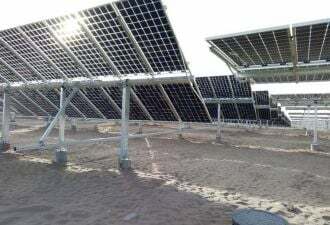 In Sheep Creek near Victorville located in Southern California, developer Jaton is working on a 3-megawatt solar farm in Southern California Edison’s territory territory. Jaton formed in 2016 and seeks to take advantage of the state’s community solar programs. In Campo, a town along the Mexico border, ForeFront Power is developing a 2.4-megawatt project with San Diego Gas & Electric. In Fresno County in Northern California, ForeFront is working with Pacific Gas & Electric (PG&E) on a 1.656-megawatt project. While the going is rough, ForeFront is emerging as a key developer in California’s fledgling community solar programs. 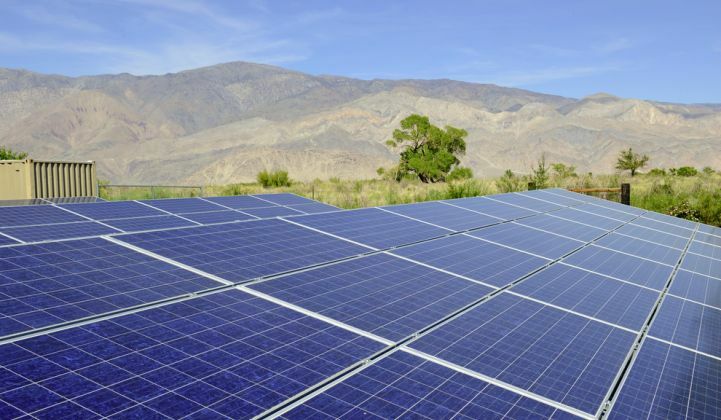 In 2018, PG&E put out a call for community solar proposals, and ForeFront submitted 11 projects that exceed 37 megawatts of power, all of which have the potential to come online in the future. In a public letter dated February 4, 2019, the utility noted that ForeFront’s projects were “selected for award and continued participation." One issue with the Enhanced Community Renewables program is that the solar comes at a premium, rather than offering customers savings, because these projects don't qualify for net metering credits. PG&E started offering community solar at a premium in 2015, and it's taken years to see any real action. The program creates a 20 percent bill reduction for people who live in areas with lots of air pollution and poverty and who want to participate in community solar. The projects must be located within a 5-mile area of their home. Solar developers and utilities operate with traditional power-purchase agreements. In Southern California, SCE is well positioned to take advantage of the new tariff. Nearly half of the neighborhoods that qualify for this new program are within its territory, according to the utility. SCE estimates that it can service 5,200 customers with the 18 megawatts allotted to the utility under the program. The Enhanced Community Renewables program and the Community Solar Green Tariff program aren't the only pathways to deploying solar in the Golden State. Last year, SCE proposed a suite of community oriented solar programs to address some of the other programs' pitfalls. Customers with Sacramento Municipal Utility District can already participate in a separate community solar program. Local organizations that procure power for residents, the community-choice aggregators (CCAs), are also developing their own initiatives. When it comes to the Community Solar Green Tariff, however, CCAs could create a pain point. SCE’s territory in particular includes many "disadvantaged communities" that qualify for the program, but a lot of these communities overlap with CCA territory, which could create problems if the local groups pursue their own community solar programs. PG&E has less overlap between its qualifying neighborhoods and the CCA service area within its territory, which means that it might be in a position to move more quickly, according to Guzman Aceves. Regulators are currently reviewing proposals under the Community Solar Green Tariff, which is expected to come online in the second quarter of 2019. Proposal backers believe that building solar within polluted neighborhoods will reduce air pollution, but some developers complained that the program’s constraints are too tight and might limit growth. He added that the CPUC’s new community solar contracts are a good sign, but they don’t guarantee that anything will be built. Instead, Smithwood argues that community solar can be used as a way to expand and experiment with successor programs to net metering. “That's a way to create a community solar program that's not these individual programs that have a ton of really complex requirements and restrictions,” he said. Guzman Aceves expressed concern about introducing a net energy metering (NEM) structure for community solar because of what she called a rise in predatory actions by electricity service providers. Last September, SCE asked regulators to approve a slate of community-oriented clean energy options. At the time, it acknowledged that the current program for community solar wasn’t working very well. It crafted an alternative set of programs. Altogether, SCE’s proposal generates 181 megawatts' worth of new projects, with a 45-megawatt carve-out for low-income participants. The utility estimates the suite of programs could serve more than 82,000 customers. With one initiative, SCE could aggregate customers for community solar projects itself, rather than solicit a developer or a community-based organization to do that work through contracts. CPUC officials are currently reviewing the proposal, and approval is not guaranteed. In a memo, officials questioned whether SCE could end its existing program without violating regulations. The idea is to pair city loads with renewable generation. If the program can scale, it will be be accessible to all of the group’s customers. Chaset said that unlike the CPUC programs, there would be no third-party project owner. Instead, the city would contract for the project directly through the CCA. Customer demand would be the only cap on the program’s growth. Projects could be built locally or located farther away. Grid Alternatives, one of the largest nonprofit solar installers in the U.S., is also moving into community solar in Southern California. It is working with SCE, the Greenlining Institute, and other policy and advocacy organizations on a pilot initiative called the Clean Energy Access Working Group. The goal is to create community solar projects that are designed, led and owned by local groups. While still in development, one potential site is in Compton on land owned by Ujima Housing Corporation, a nonprofit group, according to SCE. The group recently hosted a conference on the subject in Los Angeles. The meeting explored successful models from across the country and pathways to improve programs in California. Community solar holds potential for a lot of stakeholders in California. The challenge has been and will continue to be finding ways to harness that opportunity.